The Information & Resource Centre was established in the framework of the children and youth programme to assist unemployed youth and school drop-outs regarding their career guidance, job and study opportunities, CV writing and application for bursaries. Especially the Department of Social Development was very interested in this approach and the Centre and the advice of the NWF staff members has proven as a valuable asset for young people. From February until July 2013 NWF assisted 151 young people with applications to FET (Further Education Training Colleges). Especially with the False Bay College NWF established a very good partnership. 44 young people attended an Information evening of False Bay College at NWF and 32 attended the first open day of the College at the Muizenberg Campus. A further 8 applications were submitted and successful at universities in Cape Town. 38 young people were assisted with applications and preparation for assessments at Chrysalis Academy and in average approx. 30 people each month were assisted with the write-up and typing of CVs and job applications. One Computer and Life skills training course was conducted by Training Coordinator Rukea Brenner. 16 participants registered for the course but only 12 completed the course successfully. After many years with NWF, Rukea Brenner left the organisation in 2013 and is working now for the False Bay College. New World Foundation was able to recruit an excellent young man, who started to teach and conduct the training in the beginning of August 2013. Two Home based care trainings in cooperation with St. Johns and two trainings in cooperation with a private facilitator have been conducted in the period of Feb. 2013 –July 2013. Because of the high demand, two additional trainings were planned in October/November 2013. Especially the trainings of St. Johns were well attended and have had a high success rate. Out of 42 participants, 38 completed the course successfully. In total, 30 signed up for the trainings with the private facilitators and 21 completed the courses successfully. 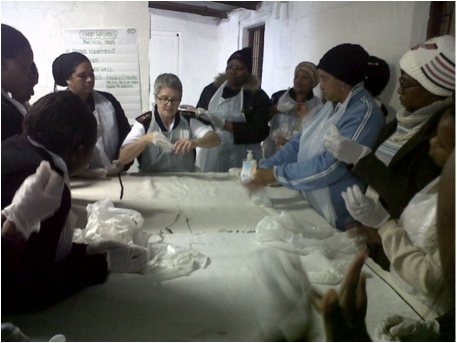 The trainings were conducted in March/April and July/August in the Lavender Hill and Vrygrond/Capricorn NWF Centres. All participants were mainly young women (age group 18-35 years) with a few exceptions of older women participating in the training. All participants who successfully completed the trainings were placed for practical training on a volunteer/stipend basis in cooperation with the NGO “Compassion in Action”.